Winter "svyatki" time from Orthodox Christmas eve (Jan. 6) until Orthodox Epiphany (Jan. 19) is a perfect time for magic. 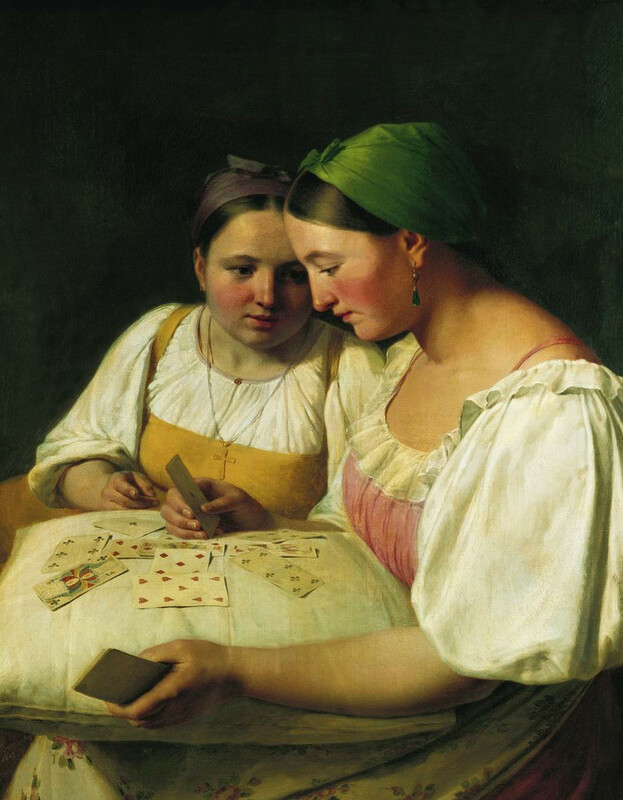 Here are 10 moments of divination captured by Russian artists. 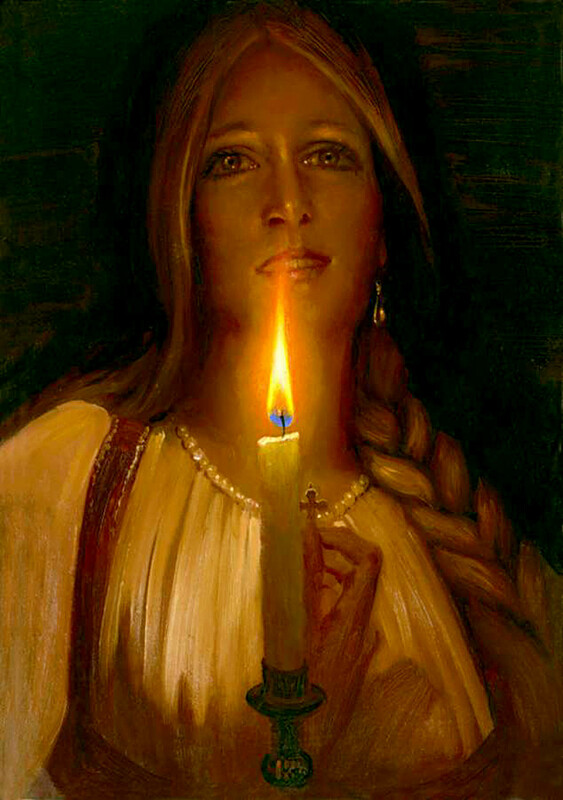 During long winter evenings and nights young Russian women from ancient times up to the 20th century used to dream about their future. The one question most of them wanted an answer to involved their future husband. Who would he be and when would he arrive? 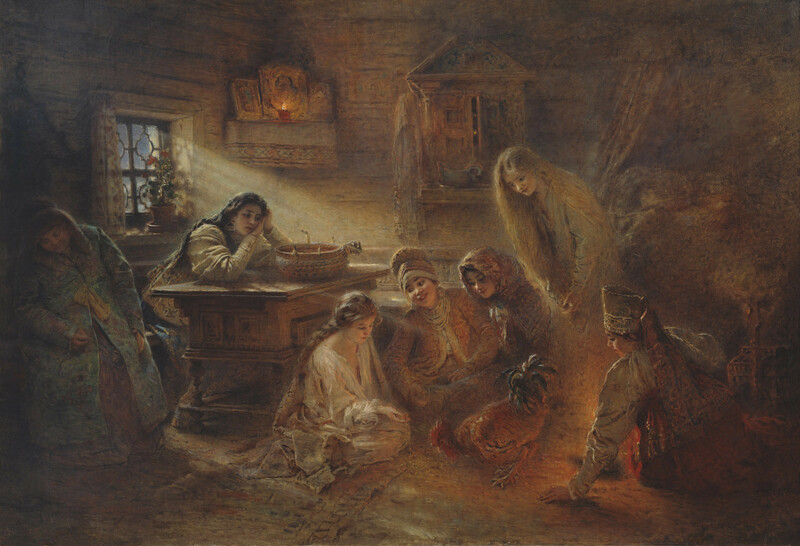 Girls impatiently waited for "svyatki" to carry out special fortune telling rites, which were by the way forbidden and banned by the Orthodox Church who slammed them as pagan. 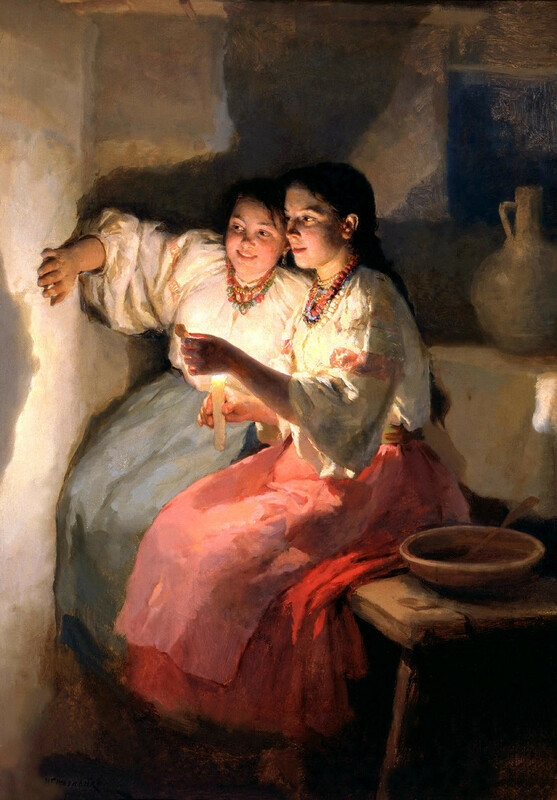 But throughout the ages young women would do their magic actions secretly, which were usually passed down to them from their mothers and grannies. You can read more about why this time was chosen for fortune telling and contacting the netherworld. 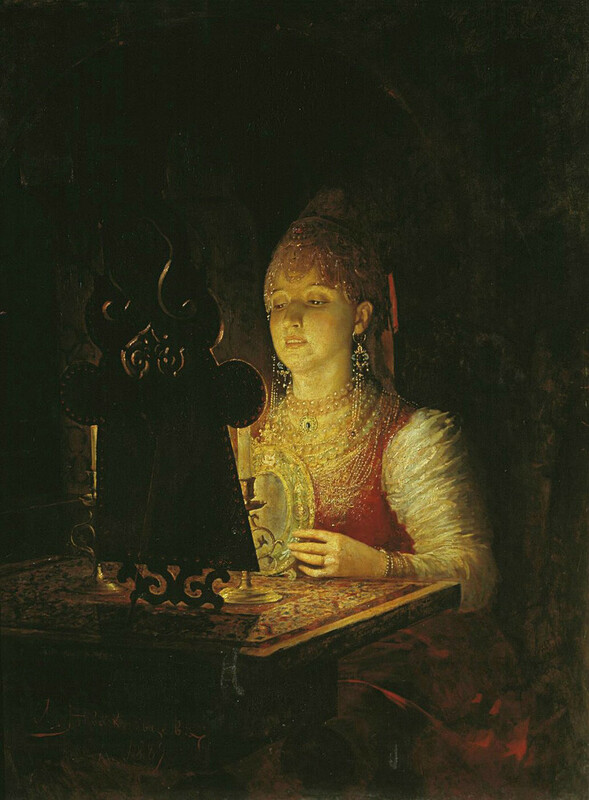 The tradition of divination became popular in art after the poet Vasily Zhukovsky depicted it in his work Svetlana (1813). In the poem Svetlana expects to see her fortune on the stroke of midnight but instead a betrothed man drags her to hell during a snowstorm. A flying raven caws at her and horses run around. She appears at a funeral and sees a dead man standing up...scary stuff. But eventually Svetlana wakes up and it turns out everything was only a nightmare. "O, never know these frightful dreams, thou, my Svetlana!" Zhukovsky writes in the end, hinting that it’s better to pray to God and trust in Providence. 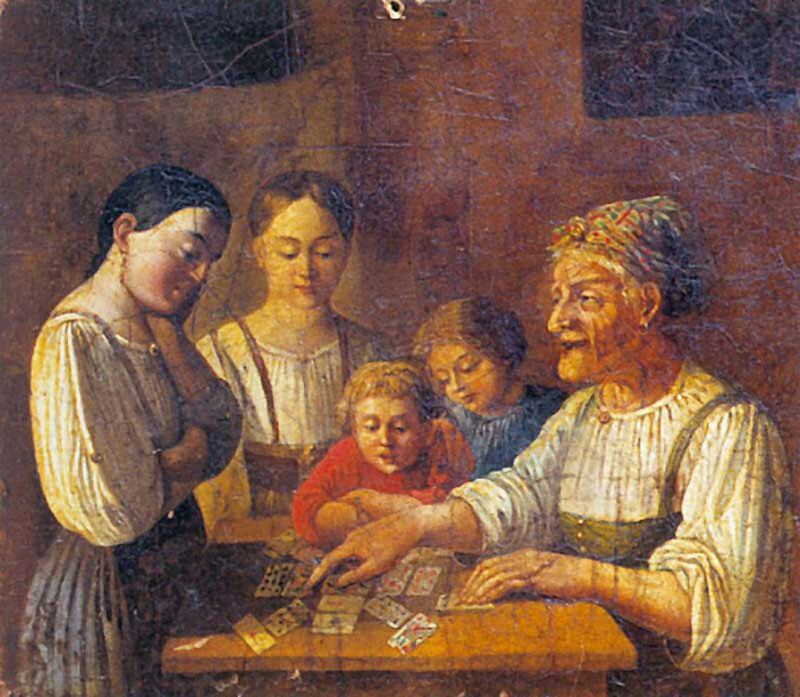 One of the most popular ways of fortune telling was with cards. Before going to bed excited girls would lay four kings under their pillow while saying aloud: "Who is my betrothed, come to me in a dream." If a King of Spades appeared in their dream it meant their groom would be old and jealous. A King of Hearts predicted a young and rich husband, King of Clubs - an army officer or a merchant, while a King of Diamonds meant a girl got the man she wanted. Burning a sheet of paper and examining the shadow it cast was a simple but popular way of predicting the future, but it’s not clear of course how these images were interpreted. In villages it was very popular to use a rooster to predict fate. Seeds or money would be put on one plate and water in another. A mirror would be placed nearby and a hen brought. If the rooster walked up to the mirror then the future groom would be gorgeous and tender, if the chicken chose the seeds instead - the groom would be rich. If the rooster approached the water it’s believed the man would drink too much booze, while if the cockerel went for the hen the man would be a womanizer. 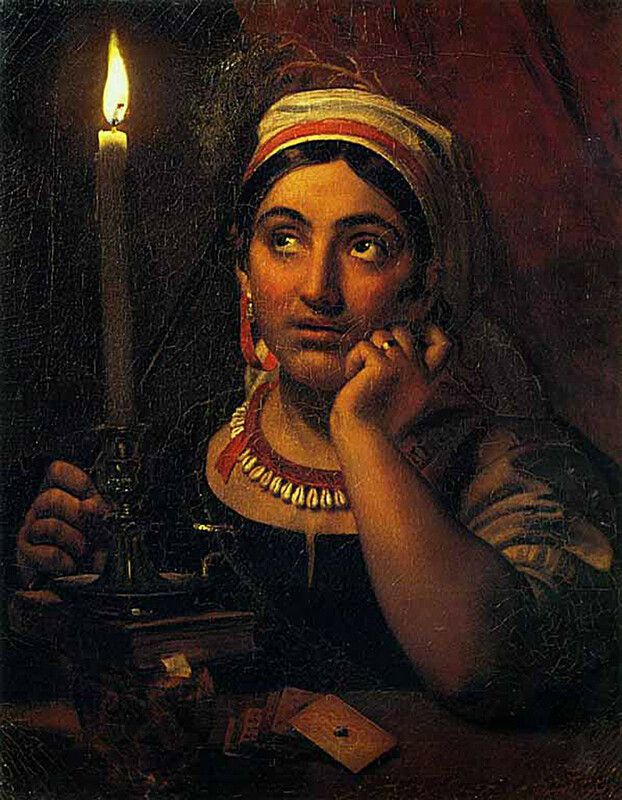 Candles were the most popular devices for fortune telling, obviously the method is connected with a lack of electricity and nighttime. 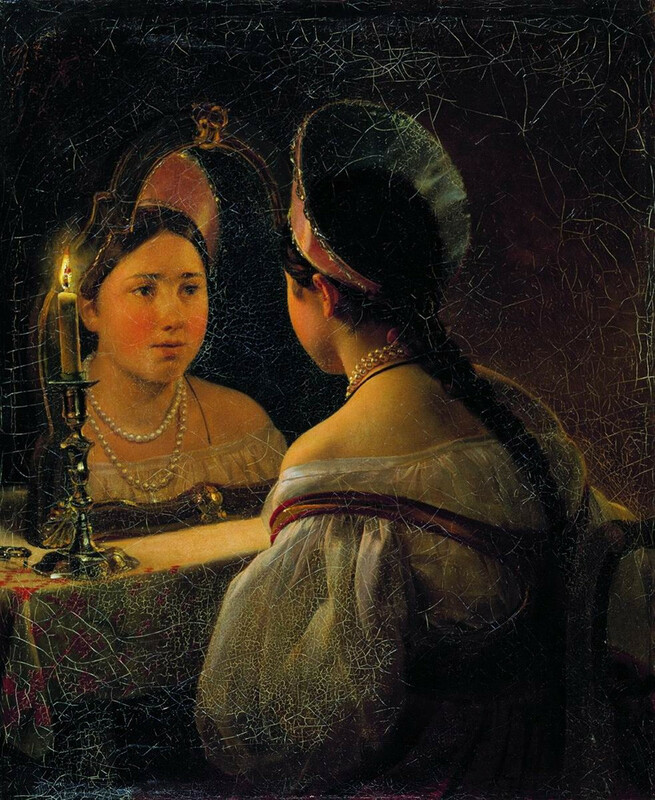 In Svetlana, Zhukovsky describes this technique: A girl sits alone in a dark, silent room, places two mirrors opposite each other, and places two candles either side of the mirrors. She says aloud "My betrothed, show up to me" and starts looking into the mirrors searching for the image of her future husband. Sometimes he showed up quickly but expectant girls often sat for hours waiting. 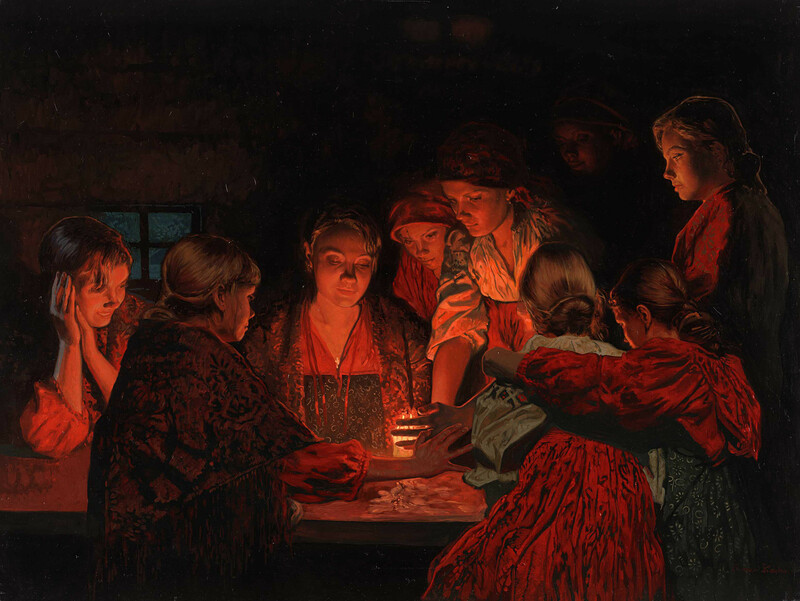 Fortune telling is still popular in Russia, especially among school girls, though it’s not taken very seriously these days. TV series such as Charmed got people interested in magic and has influenced many to experiment with different kinds of handmade Ouija boards. One of the easiest ways to see into the future is by putting several items in a bag before pulling them out without looking. The chosen object symbolizes your life in the next year. Sugar – happiness, a ring – marriage, onion – tears, money – wealth. You can put anything with any meaning in the bag though. 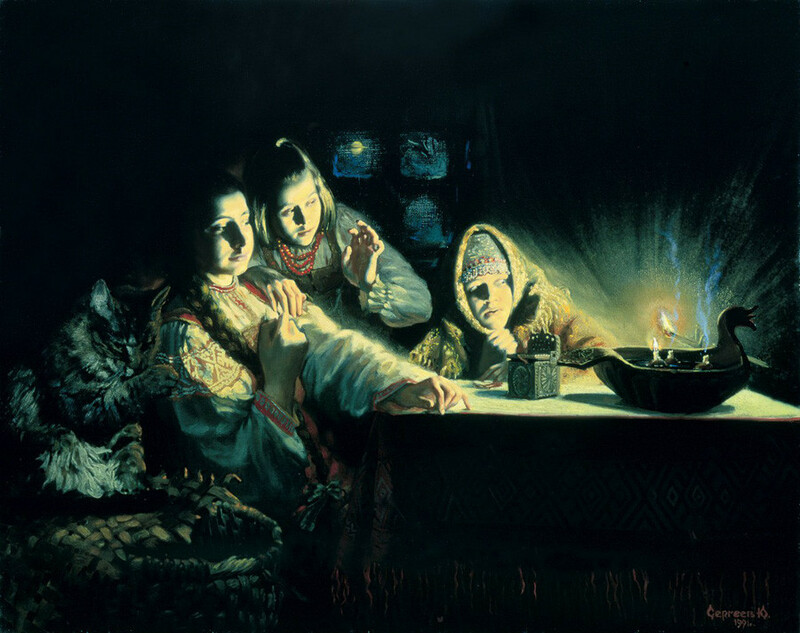 If you haven’t had a crack at fortune telling yet you can do it this winter during Kupala Night. If you want to delve deeper into the world of Slavic traditions, find out how to arrange a party a la russe.